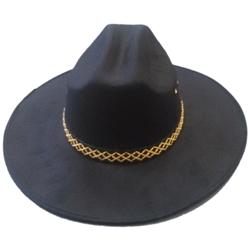 Black felt cowboy hat with gold decorative crosshatch band and accents. Hat is one size fits most up to a 23" head measurement. This traditional style cowboy hat can be used as part of a cowboy Halloween costume or by directors who are directing western themed shows such as Annie Get Your Gun or Oklahoma. Pair this hat up with a full cowboy costume to complete the look or mix and match it with our cowboy and western themed costume accessories to create a cowboy look unique to you.